The fourth and final week of the NFL’s preseason schedule is in the books and it’s time to reflect on the weekend’s top-graded players based upon hours and hours of our team of analysts watching every player on every play of every game. With preseason being such a unique proposition, making this team isn’t quite as simple as earning the highest grade at your position in a given week. Weighting has been given towards playing time, as well as doing your good work against the first- and second-string opposition units in an attempt to strike a balance between the best production over the longest stretch of playing time, and against the best standard of players. Check out all preseason information including every player’s grade with PFF Elite and Premium Stats 2.0. All the talk in New York has been about Sam Darnold and Teddy Bridgewater this preseason, but in 16 snaps McCown reminded people he’s still a capable veteran presence in their locker room. He only completed 3-of-8 pass attempts, but he had three passes dropped, and was accurate on 85.7 percent of his attempts. By far the best performance this week from a running back, Nall had just five carries, but they went for 79 yards, 77 of which came after contact as he broke three tackles along the way, making some nice reads at the line to make decisive cuts into space. Catching four passes for 122 yards, Pringle was a big-play threat this week for the Chiefs. He was only on the field for 15 snaps, but he saw the ball come his way on almost 50 percent of those snaps. Arguably the best statistical standout of the final preseason game, Hatcher also racked up an impressive PFF grade for his display. Catching eight of the 10 targets he had across 31 snaps, he gained 128 yards and scored three times. With 32 snaps to his name for the Chiefs this week, Amaro was the standout performer at the tight end position. He graded well in all facets of the game, and all four passes that he caught moved the chains for first downs. Hodges was only on the field for 15 snaps against the Panthers this week, but he caught two passes for 43 yards including an impressive adjustment to haul in a target that had less than ideal ball placement. On the field for 51 snaps of pass protection, Clark more than held his own for the Colts, surrendering just one hurry and earning a PFF grade of 86.1. A former starter on the Seahawks offensive line, Glowinski was a member of the Colts unit that featured some high-level displays in their final preseason encounter. In 22 snaps of pass protection, Glowinski didn’t allow a single pressure. The Eagles have the game’s best offensive line heading into the season, and Toth was battling to show he can be a quality depth player for Philadelphia. Though he did surrender a sack and a hurry across 49 pass-blocking snaps, his run-blocking was reminiscent of starter Jason Kelce with his movement to his blocks. Across 15 snaps of pass protection, Douglas didn’t surrender a single pressure, nor was he beaten by his man only to get bailed out by the quarterback or a penalty. His run-blocking was also formidable across 11 run snaps. 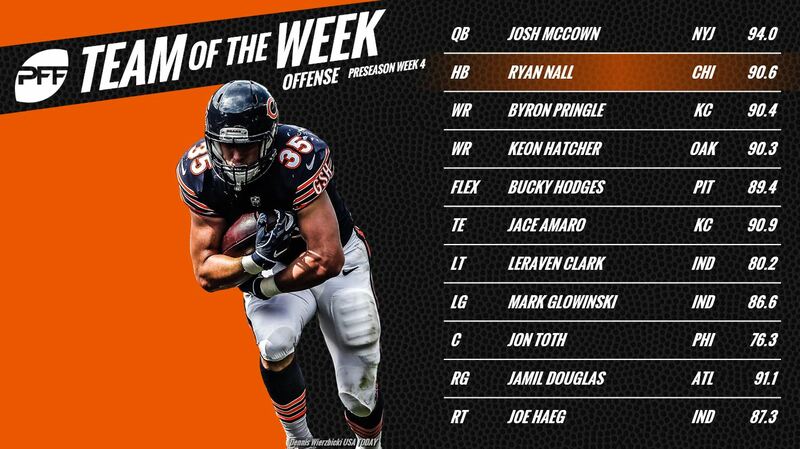 Another member of the Colts finds their way onto the final preseason team of the week in the shape of Haeg. The former fifth-round pick didn’t surrender any pressure across 22 pass-blocking snaps against Cincinnati. The Hard Knocks star battling to make the final roster in Cleveland did himself a world of good in the final preseason encounter before real football action. Orchard had an outstanding interception as he recognized a pass at the line and took it back to the house, but he also had four hurries as a pass-rusher. Run defense was Reid’s calling card this week for the Cowboys. He had two hurries across 16 pass-rushing snaps, but his run defense was on another level, notching five defensive stops which led the team against the Texans. One of the best grades of this week of preseason, Bromley was one of the few interior linemen to do it as a pass-rusher rather than against the run. He had four total pressures from only 20 pass-rushing snaps, with one more beaten block that didn’t get a chance to become pressure. One of the preseason’s most consistent performers, Means once again impressed as a pass-rusher for the league’s most loaded defensive front. Means notched four more total pressures across 19 pass-rushing snaps. 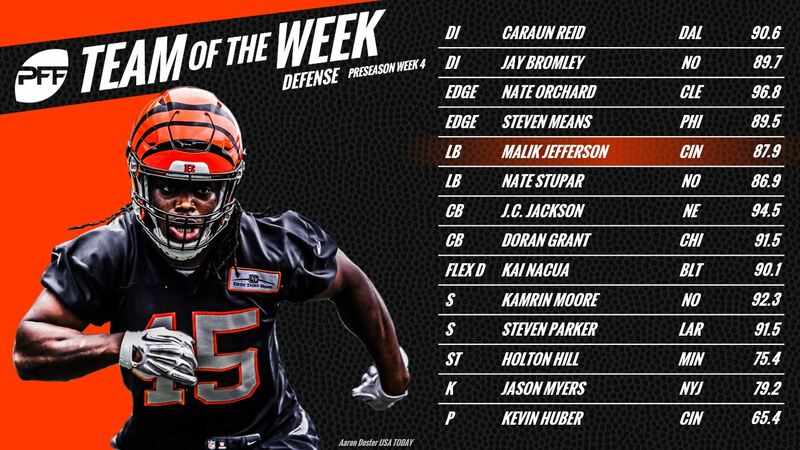 With 67 snaps of playing time, Jefferson had one of the highest workloads of any linebacker this week for the Bengals. He showed particularly well in coverage, breaking up two passes including one deep down the field. Stupar was targeted once in this game from 23 snaps in coverage, and he notched an interception as well as two defensive stops in the passing game as well as grading well as a blitzer. Stupar played 49 snaps overall. Though he did surrender a touchdown, that was the only catch that Jackson allowed against the Giants. Outside of that play, he more than offset it with a pair of interceptions and two pass breakups on five targets. From six targets against the Bills, Grant surrendered just 20 total yards, while picking off a pass and breaking up another. The longest catch he gave up was to Zay Jones, who managed just eight yards on his reception. A forced fumble was the biggest play of Moore’s day against the Rams, knocking the ball loose from WR Fred Brown. Moore also notched three defensive stops overall and was only downgraded once. The safeties to appear on this team of the week both came from the same game, albeit from different teams, with Parker joining Moore. Like Moore, Parker had one big play to lift his performance, with an interception on a late and ill-advised pass from J.T. Barrett landing in his hands for the turnover. One of the best plays of the week came from Nacua, who earned an interception the hard way by rising to take the ball away from TE Garrett Hudson on a slightly high pass. He also made two defensive stops elsewhere in the game. Myers only attempted two field goals, but connected on both, with one coming from 43 yards out, and the other from a whopping 58 yards. He also boomed three touchbacks, showing off his strong leg. There were no return touchdowns this week, but Hill did a solid job and had a 53-yard kick return. He also added 31 yards on four punt returns, including a long of 12 yards.